This article is about the film. For the soundtrack, see A Christmas Carol (soundtrack). For other uses, see A Christmas Carol (disambiguation). A Christmas Carol is a 2009 American 3D computer animated dark fantasy film written, co-produced, and directed by Robert Zemeckis. It is an adaptation of Charles Dickens's 1843 story of the same name and stars Jim Carrey in a multitude of roles, including Ebenezer Scrooge as a young, middle-aged, and old man, and the three ghosts who haunt Scrooge. The film also features supporting roles voiced by Gary Oldman, Colin Firth, Bob Hoskins, Robin Wright, and Cary Elwes. The film was released in Disney Digital 3D and IMAX 3D on November 3, 2009, by Walt Disney Studios Motion Pictures. It received its world premiere in London, coinciding with the switching-on of the annual Oxford Street and Regent Street Christmas lights, which in 2009 had a Dickens theme. The film received mixed reviews from critics, who praised its visuals and the performances of Carrey and Oldman, but criticized its dark tone. It earned $325.3 million on a $175–200 million budget. The film was produced through the process of motion capture, a technique Zemeckis used in his previous films The Polar Express (2004) and Beowulf (2007). It is Disney's third film retelling of A Christmas Carol, following 1983's Mickey's Christmas Carol and 1992's The Muppet Christmas Carol. In 1843, on Christmas Eve, Ebenezer Scrooge, a miserly old moneylender at a London counting house, does not share the merriment of Christmas. He declines his cheerful nephew Fred's invitation to a Christmas dinner party, and rejects two gentlemen's offer to collect money for charity. His loyal employee Bob Cratchit asks Scrooge to allow him to have a day off on Christmas Day to spend time with his family, to which Scrooge reluctantly agrees before leaving. In his house, Scrooge encounters the ghost of his deceased business partner Jacob Marley, who warns him to repent his wicked ways or he will be condemned in the afterlife like he was, carrying heavy chains forged from his own greediness. Jacob informs Scrooge that he will be haunted by three spirits, who will guide him out of his misery. First, Scrooge is visited by the candle-like Ghost of Christmas Past, who takes him back in time to his childhood and early adult life. They visit Scrooge's boarding school and Scrooge sees his sister Fan, who became the mother of Fred. Scrooge later begins a successful career in business and money lending as an employee under Fezziwig, and he becomes engaged to a woman named Belle. However, the Ghost shows Scrooge how Belle left him when he became obsessed with wealth. A devastated Scrooge extinguishes the spirit with its candle snuffer cap. Next, Scrooge meets the merry Ghost of Christmas Present, who shows him the joys and wonder of Christmas Day. Scrooge and the Ghost visit Bob's house, learning his family is content with their small dinner. All the while, Scrooge starts to take pity on Bob's ill son Tiny Tim. The Ghost abruptly ages, commenting that Tiny Tim will likely not survive until next Christmas. The Ghost warns Scrooge about the evils of "Ignorance" and "Want"; Big Ben begins tolling midnight as "Ignorance" and "Want" manifest themselves before Scrooge as two wretched children who grow into violent, insane individuals, leaving the spirit withering away, dying at length when midnight strikes. Finally, the Ghost of Christmas Yet to Come arrives, appearing as a dark shadow, and takes Scrooge into the future. He witnesses a group of businessmen discussing the death of an unnamed colleague; saying they would only attend the funeral if lunch is provided; Scrooge recognizes his charwoman Mrs. Dilber selling the stolen possessions of the deceased. Shortly afterwards, Scrooge sees the aforementioned colleague's body on a bed, followed by a vision of a family who is relieved that he is dead, as they have more time to pay off their debt. The spirit transports Scrooge to Bob's residence, discovering that Tiny Tim has died. Scrooge is then escorted to a cemetery, where the Ghost points out his own grave, revealing Scrooge as the man who died. Scrooge decides to change his ways just as the Ghost forces him to fall into his empty coffin lying in a deep grave that sits above the fires of Hell. Waking up in his own room on Christmas Day, with love and happiness in his heart, a gleeful Scrooge decides to surprise Bob's family with a turkey dinner, and ventures out with the charity workers and the citizens of London to spread happiness in the city, and later attends his nephew's annual Christmas dinner, where he is warmly welcomed. The following day, he gives Cratchit a raise and becomes a father figure to Tiny Tim, who escapes death. A changed man, Scrooge now treats everyone with kindness, generosity, and compassion; he now embodies the spirit of Christmas. Jim Carrey as Ebenezer Scrooge, a stingy, selfish old man, whose sheer miserly nature leads him to despise Christmas and all things which engender happiness. Carrey also voices Ghost of Christmas Past, the first of the three spirits that haunt Scrooge in order to prompt him to repent. He is depicted as an androgynous man with a flickering flame for a head and a body like a candle, and speaks with an Irish accent, Ghost of Christmas Present, the second of the three spirits. He is depicted as a towering man with red hair, a full beard, and a green ermine robe. He is a jolly figure prone to hearty laughter, talking with a Yorkshire accent, and Ghost of Christmas Yet to Come, the third of the three spirits. It is depicted as a shadowy Grim Reaper cast across the ground or a wall and occasionally emerges into three dimensions to point at something or to chase Scrooge in a large, shadow-like horse-drawn hearse, pulled by stampeding horses. Gary Oldman as Bob Cratchit, Scrooge's cheerful assistant and underpaid clerk. Oldman also voices Jacob Marley, the ghost of Scrooge's former colleague, bound in chains and damned to walk the earth in penance of a cold-hearted life and does the motion capture for Tiny Tim, Cratchit's youngest son. Ryan Ochoa provides the voice of Tiny Tim. Colin Firth as Fred, Scrooge's cheerful nephew and only living relative. Fred is the son of Scrooge's little sister Fan. Bob Hoskins as Mr. Fezziwig, the proprietor of a warehouse business for whom Scrooge worked as a young apprentice. Hoskins also voices Old Joe, a fence who buys the belongings of the deceased Scrooge from Mrs. Dilber. Elwes would also act as a stand-in for Scrooge, the Ghost of Christmas Past, and the Ghost of Christmas Present in scenes where two Carrey characters appear together, standing-in as the character interacting with Carrey during filming of his (Carrey's) scenes. An example would be, that whenever filming scenes with Scrooge and the Ghost of Christmas Past, Carrey would perform as the Ghost, while Elwes would act as a stand-in for Scrooge, feeding that character's lines to Carrey, as vice versa when Carrey performed as the Ghost. Fionnula Flanagan as Mrs. Dilber, Scrooge's charwoman. Robert Zemeckis has stated previously that A Christmas Carol is one of his favorite stories dealing with time travel. Carrey has described the film as "a classical version of A Christmas Carol […] There are a lot of vocal things, a lot of physical things, I have to do. Not to mention doing the accents properly, the English, Irish accents […] I want it to fly in the UK. I want it to be good and I want them to go, 'Yeah, that's for real.' We were very true to the book. It's beautiful. It's an incredible film." Disney partnered with Amtrak to promote the film with a special nationwide train tour, starting in May 2009 and visiting 40 cities, finishing in New York in November. A Christmas Carol opened London on November 3, 2009, and was theatrically released on November 6, 2009, in the United States by Walt Disney Pictures. Disney released the film on November 16, 2010 in a single-disc DVD, two-disc 2D Blu-ray/DVD combo and in a four-disc combo pack that includes a Blu-ray 3D, a Blu-ray 2D, a DVD and a digital copy. This marked the first time that a film was available in Blu-ray 3D the same day as a standard Blu-ray 2D, as well as Disney's first in the Blu-ray 3D market along with Alice in Wonderland. The DVD contains deleted scenes and two featurettes called "On Set with Sammi" and "Capturing A Christmas Carol". The Blu-ray 2D also has a "Digital Advent Calendar" and the featurette "Behind the Carol: The Full Motion Capture Experience". The Blu-ray 3D has an exclusive 3D game called "Mr. Scrooge's Wild Ride". The film opened at #1 in 3,683 theaters, grossing $30,051,075 its opening weekend, with an average of $8,159 per theater. The film has come to gross an estimated $137,855,863 in the United States and Canada and $187,430,783 in other territories, for a worldwide total of $325,286,646. 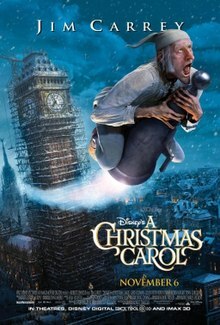 In the UK, A Christmas Carol topped the box office on two separate occasions; the first was when it opened, the second was five weeks later when it leapfrogged box office chart toppers 2012, The Twilight Saga: New Moon and Paranormal Activity despite family competition from Nativity!, another Christmas-themed movie. The film received mixed reviews from American film critics. In his review, Roger Ebert of the Chicago Sun-Times gave the film four stars (out of four), calling it "an exhilarating visual experience". Owen Gleiberman of Entertainment Weekly gave the film an A, applauding the film as "a marvelous and touching yuletide toy of a movie". Joe Neumaier of the New York Daily News gave the film 3/5 stars and stated the film "is well-crafted but artless, detailed but lacking soul." Mary Elizabeth Williams of Salon.com gave the film a mixed review claiming the movie "is a triumph of something—but it's certainly not the Christmas spirit." Joe Morgenstern of The Wall Street Journal wrote in his review that the film's "tone is joyless, despite an extended passage of bizarre laughter, several dazzling flights of digital fancy, a succession of striking images and Jim Carrey's voicing of Scrooge plus half a dozen other roles." The Daily Telegraph reviewer Tim Robey wrote, "How much is gained by the half-real visual style for this story is open to question—the early scenes are laborious and never quite alive, and the explosion of jollity at the end lacks the virtue of being funny." Peter Bradshaw in The Guardian also criticized the technology: "The hi-tech sheen is impressive but in an unexciting way. I wanted to see real human faces convey real human emotions." Time Out London praised the film for sticking to Dickens' original dialogue but also questioned the technology by saying, "To an extent, this 'Christmas Carol' is a case of style—and stylisation—overwhelming substance." Review aggregator Rotten Tomatoes reports that 54% of 192 critics have given the film a positive review, with a rating average of 5.9/10. The site's consensus is: "Robert Zemeckis' 3-D animated take on the Dickens classic tries hard, but its dazzling special effects distract from an array of fine performances from Jim Carrey and Gary Oldman." Metacritic, which assigns weighted average rating, has a score of 55 out of 100 based on 32 reviews. Audiences surveyed by CinemaScore gave the film a grade B+. The theme song "God Bless Us Everyone" was performed by Italian tenor Andrea Bocelli. ^ "A CHRISTMAS CAROL (PG)". British Board of Film Classification. October 7, 2009. Retrieved November 24, 2012. ^ Barnes, Brooks (October 26, 2009). "Disney Hopes Christmas Carol Lives Up to Its Blockbuster Marketing". New York Times. Archived from the original on November 25, 2011. Retrieved October 25, 2009. ^ a b c "A Christmas Carol (2009)". Box Office Mojo. Archived from the original on November 29, 2009. Retrieved November 28, 2009. ^ a b Fleming, Michael (October 6, 2008). "Jim Carrey set for 'Christmas Carol': Zemeckis directing Dickens adaptation". Variety. Retrieved December 15, 2018. ^ McClintock, Pamela (February 7, 2008). "Studios rush to fill '09 schedule". Variety. ^ "Dickens theme for festive lights". BBC News. September 13, 2009. Archived from the original on September 8, 2017. Retrieved September 13, 2009. ^ Hall, James (September 12, 2009). "Disney's A Christmas Carol will be theme for London's Christmas lights". Daily Telegraph. Archived from the original on September 12, 2009. Retrieved September 13, 2009. ^ Making the Trilogy: Part 1 featurette on the Back to the Future (film series)|Back to the Future Trilogy]] DVD box set. ^ "In the Future: Jim Carrey". ComingSoon.net. March 7, 2008. Archived from the original on October 8, 2012. Retrieved December 15, 2018. ^ Orndorf, Brian (November 8, 2010). "Disney's A Christmas Carol (Blu-ray)". DVD Talk. Archived from the original on February 19, 2014. Retrieved January 30, 2014. ^ Garrett, Diane (January 7, 2010). "3D for the home coming". Variety. Archived from the original on February 26, 2014. Retrieved January 30, 2014. ^ "Disney's A Christmas Carol Movie Review". Chicago Sun-Times. November 5, 2009. Archived from the original on November 8, 2009. Retrieved November 6, 2009. ^ "Disney's A Christmas Carol Movie Review". Entertainment Weekly. November 6, 2009. Archived from the original on November 7, 2009. Retrieved November 6, 2009. ^ Neumaier, Joe (November 5, 2009). "Disney's A Christmas Carol in Disney Digital 3D: Blah, humbug! 'A Christmas Carol's 3-D spin on Dickens well done in parts but lacks spirit". New York Daily News. Archived from the original on November 9, 2009. Retrieved November 6, 2009. ^ Williams, Mary Elizabeth (November 5, 2009). "Disney's "A Christmas Carol": Bah, humbug!". Salon.com. Archived from the original on January 11, 2010. Retrieved September 27, 2015. ^ Morgenstern, Joe (November 6, 2009). "'A Christmas Carol': Carrey, Disney Play Scrooge". The Wall Street Journal. Archived from the original on September 28, 2015. Retrieved September 27, 2015. ^ Robey, Tim (November 5, 2009). "A Christmas Carol, review". The Daily Telegraph. London. Archived from the original on June 24, 2016. Retrieved April 5, 2018. ^ Peter Bradshaw (November 6, 2009). "Film review: A Christmas Carol | Film". The Guardian. London. Archived from the original on January 21, 2018. Retrieved November 14, 2010. ^ "A Christmas Carol Review. Movie Reviews - Film - Time Out London". Timeout.com. Archived from the original on January 11, 2013. Retrieved November 14, 2010. ^ "Disney's A Christmas Carol (2009)". Rotten Tomatoes. Fandango. Archived from the original on December 26, 2016. Retrieved October 18, 2018. ^ "Disney's A Christmas Carol: Reviews (2009)". Metacritic. CBS Interactive. Retrieved December 15, 2018.